Wooden side and bottom storage shelves. The Landmann Smoky Mountain 38-inch Vertical Gas Smoker with two Heat Saving Drawers and Wide Chamber provides 1576-square inch of cooking area to smoke your favorite meats, fowl and fish. Features heat saving EASY ACCESS drawers with handle to access wood chip box and water pan without opening main chamber door. Magnetic door closing system efficiently latches door. Fully adjustable heat control with front door temperature gauge. adjustable top chimney and side damper vents with plastic tab guards for optimum temperature control. The Landmann Smoky Mountain 38-inch Vertical Gas Smoker with Two Heat Saving Drawers provides 1008-square inch of cooking area to smoke your favorite meats, fowl and fish. Features heat saving EASY ACCESS drawers with handle to access wood chip box and water pan without opening main chamber door. Magnetic door closing system efficiently latches door. Fully adjustable heat control with front door temperature gauge. adjustable top chimney and side damper vents with plastic tab guards for optimum temperature control. The Landmann Smoky Mountain 3495GLA 34-inch Vertical Gas Smoker provides two heat saving, easy access drawers to access the wood chip box and water pan without opening the main chamber door and releasing the heat and smoke. This unique features helps keep an even temperature for smoking a variety of meats including turkey, beef, venison, chicken, fish etc. Durable welded hinges on the door. Magnetic closures to keep door securely fastened and easily opened. Large nylon plastic door handle, 4 adjustable chrome plated cooking grates and meat hanger. The 32" Smoky Mountain vertical electric smoker is made from heavy-duty steel and provides 857 sq in of cooking space on 4 heavy-duty cooking grates. The HEAT SAVING two drawer system will allow you to access wood chip box and water pan without opening the main chamber door and releasing heat! The insulated cooking chamber has a magnetic door closure with securing latch. The large door and drawer handles will accommodate large oven mitts and provide easier access. The 26" Smoky Mountain electric smoker provides 443 sq. in. of smoking area on three chrome plated cooking grids. The independent plug-in temperature controller allows you to easily set & maintain your desired temperature throughout the smoking process. Our 3-in-1 tray incorporates the water pan, wood chip box and grease tray into one compartment that allows for ease of adding wood and/or water and allows for easier cleanup. The smoker provides the optimum temperature range and control for most common smoking applications, ranging from 100 - 260 degrees. Chrome plated cooking racks and wrought iron side handles. The 26" smoky mountain electric smoker provides 431 sq. In. Of smoking area on three chrome plated cooking grids. The independent plug-in temperature controller allows you to easily set & maintain your desired temperature throughout the smoking process. Our 3-in-1 tray incorporates the water pan, wood chip box and grease tray into one compartment that allows for ease of adding wood and/or water and allows for easier cleanup. The smoker provides the optimum temperature range and control for most common smoking applications, ranging from 100 - 260 degrees. Clear cover protects the seed cylinder and birds from weather. Holds 2 small seed cylinders. 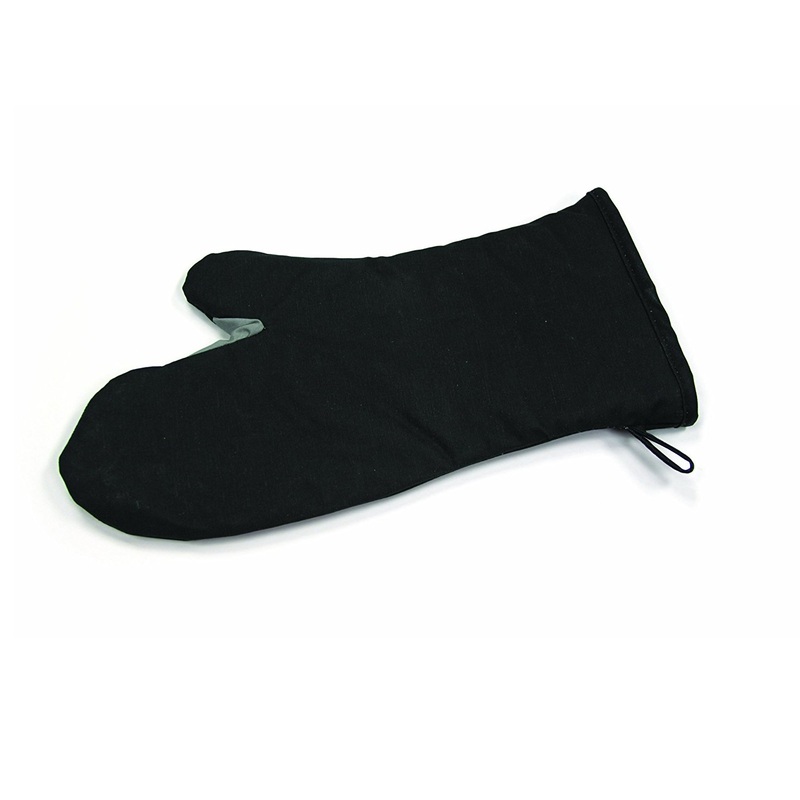 "MaxTemp" Oven Mitt is made of heavy-duty Pyrotex, which resists scorching and burning to 455 degrees. Ideal as an all purpose oven mitt where safety is important. 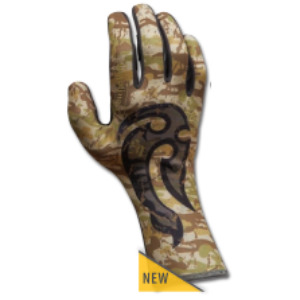 Also suitable for using outdoors when cooking on the BBQ. The Max Temp features heavy cotton batting and a steam barrier for ultimate heat protection. The thick terry lining protects from heat without sticking to the handle. It comes single-packed, not a pair. 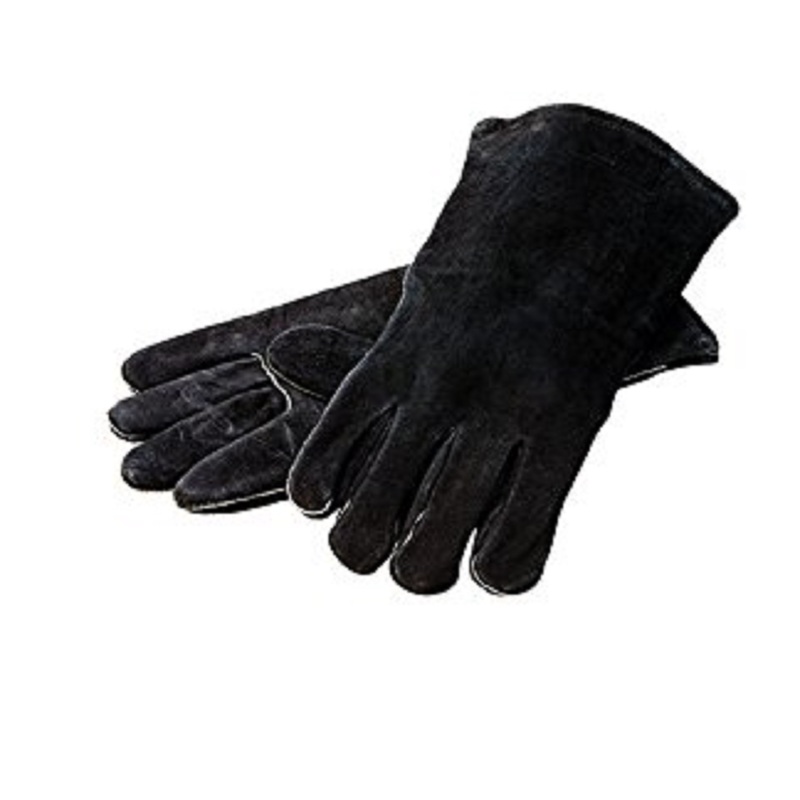 Protect your hands with the Lodge Logic Leather Gloves. 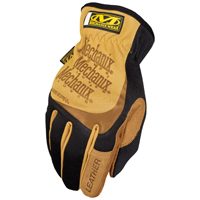 These durable gloves feature welted fingers and a classic black finish. Dimensions: 6W x .5D x 12H in. in.. Constructed with brushed leather. Black finish. 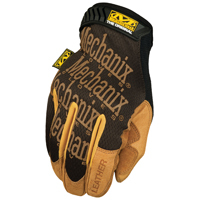 Protects from heat up to 400�F. Welted on finger seams. The Kaytee Country Barn Feeder allows for easy filling with it's large opening, yet has a lid that helps to deter squirrels. Made with weather-resistant material to reduce fading and cracking. Designed with excellent ventilation for increased air flow and drainage so seeds stay fresh longer. 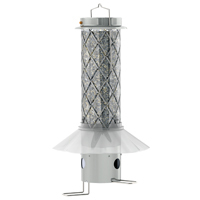 This new line of millennium classic feeders revamps everything you know about hummingbird feeders. The ant moat on top not only stops crawling insects from reaching the ports, but it also lays flat so it is easy to fill. The glass bottle is a beautiful design and a great option for anyone who is looking for a long-lasting feeder. The perches are large and rounded to allow hummingbirds to perch comfortably while they eat from any of the 5 feeding ports. The base comes apart in 2 pieces, and the bottle has a large opening for easy cleaning. All of the shapes and colors of this feeder will attract not only the older crowd of loyal feeders, but also a younger crowd of new and curious bird lovers. Add some interest and charm to your gutter downspout with one of our unique rain chains. Watch the rain trickle over and through them. A large capacity feeder with plexi-glass arch. The hinged roof opens outward for easy filling from outside the house. Attaches to window with two suction cups. 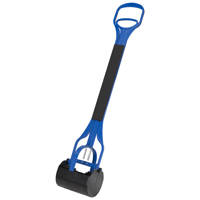 Fits windows up to 36 inches wide. 3.5 pound seed capacity. 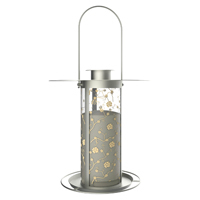 Give your home and backyard the gift of style with a gorgeous, metal, mesh bird feeder. These feeders are built with high quality materials that will leave them looking great for years. 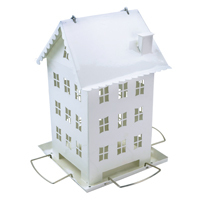 Beautifully decorated, wire mesh body, holds one standards sized suet or seed cake, durable metal chain and hook for easy display. 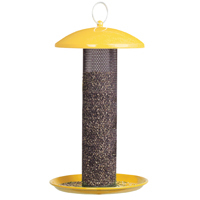 Finch Screen Feeder has an easy twist-off top and base for easy filling and cleaning. 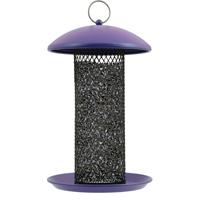 Use this feeder to attract most varieties of Finches. Feeder holds 1.3 qts (approx. 1.6 lbs) of thistle (Nyjer).